The Pygmies of the Central African rain forest may be small in stature but they make a mighty sound. The music of these primitive people, representing one of the last hunter-gatherer societies on Planet Earth, is central to their social and religious life. The children learn to sing almost before they learn to walk. When San Francisco choreographer Alonzo King first heard this music he was inspired to travel to Central Africa to check it out for himself. What resulted was a highly innovative collaboration in dance. The People of the Forest, a combined performance by King&#146;s Lines Ballet and Nzamba Lela, a group of 16 musicians from the BaAka clan of the Central African Republic is touring the United States. It does not begin as sensationally as it concludes. 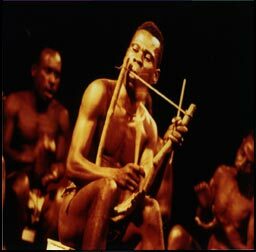 Both the singing of the BaAka and King&#146;s choreography seem to have a cumulative effect, pulling the audience in as they go along. When the curtain rises, the Pygmies sit at the back of the stage, both men and women wearing grass skirts and bells on their ankles. Before them, three women dressed in what looks like a pair of inverted white lampshades, dance. The dancing is lovely; the singing somewhat less so. Soon the dancers are joined by two men, one in Western dress; the second &#150; who dances with phenomenal physicality &#150; in a grass skirt. The disparate cultures are thus on display. The man in Western dress returns in Act Two, this time enclosed in a box. He gestures mechanically within his confines until the box is removed. Then, he collapses altogether and must be manipulated by the other dancers. Eventually, he seems to get free, sheds his many layers of clothes and dances a terrific solo. But the effort seems to exhaust him and he collapses again in a helpless heap. The Pygmies haul him off the stage. A little heavy-handed, perhaps, but a powerful metaphor for the difference between the two cultures. In between there are wonderful lighting effects: a rain forest background, dancers against their own shadows which have been transformed into cartoons, suggestions of the African earth and sky. Act One ends with an exquisite pas de deux that begins in slow motion and gradually becomes more frenzied until, in an enigmatic ending, the Pygmies bear the female dancer away. There is wonderful instrumental music with plucked strings, gourd whistles and drums. The singing picks up speed and the Pygmies begin to move and interact with the Lines dancers. The finale, a frenzied dance for the African contingent on its own, brought down the house. The Lines Ballet has taken a daring experiment in multiculturalism and turned it into a fascinating and rich evening in the theater.